Artwork by and Copyright 2015 Tricia Lupien. Hi there. I’ll be heading out this weekend to work Connecticut ComicCONN with my wife, so I’ll be away from the laptop (and not writing anything. Booooo), but I wanted to throw out a few bits o’ news, starting with a peek at Tricia Lupien’s latest draft of my new bookmark. Remember, I’m giving free bookmarks away to anyone who contacts me with a mailing address (so I can send you your goodie) and a link to a review of any Action Figures book they’ve posted on Amazon or Goodreads. That gives me two segues! First, on the topic of giveaways, I still have three codes for eight free e-books in the Indie Superhero StoryBundle to award. If you’ve never read Action Figures – Issue One: Secret Origins, or a current fan who wants to share the series with a friend, contact me and I’ll set you up with a code — or you could go buy the bundle yourself, but hurry! It’s only available for seven more days! Next, on the subject of my cover artists Tricia, she just finished work on another cover for another indie author. 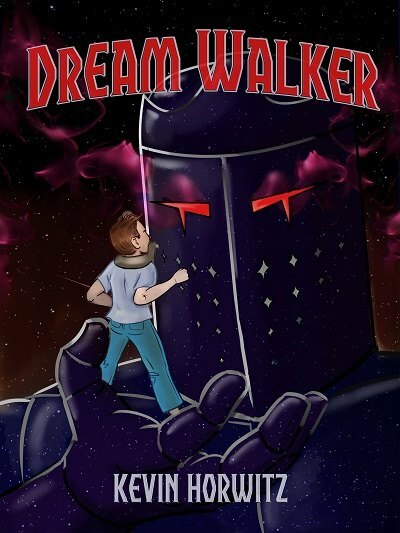 Check out her artwork for the first book in Kevin Horwitz’s Dream Walker series. Artwork by and Copyright Tricia Lupien. “Dream Walker” Copyright Kevin Horwitz. Dream Walker, FYI, is set for an October 1 release. Finally, back to me. Speaking of release dates, it’s starting to look like the release date for Action Figures – Issue Five: Team-Ups might be pushed back a little. Tricia and my editor Julie are still working on The Adventures of Strongarm and Lightfoot to get that ready for my October appearances, and they have to clear that from their respective plates before they can get to work on Team-Ups. There’s a bit of s silver lining here, however. I’m already well into draft one of Issue Six – Power Play and that should be ready for a March 2016 reelease — and based on the feedback I’ve received from my test-readers (which has been — and I’m paraphrasing slightly — “Goddammit, Mike!”), readers aren’t going to want to wait for the next book.